Fitzwilliam's architecture spans nearly 200 years. The Grove, the 19th-century house in which Emma Darwin lived after the death of her husband Charles, is surrounded by modern works by Sir Denys Lasdun, Sir Richard MacCormac, van Heyningen and Haward, Allies and Morrison, and Edward Cullinan Architects. 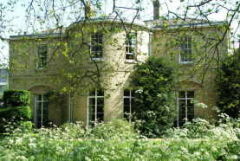 The Grove, a Grade II listed building, dates from the end of the Napoleonic Wars. First owned by its architect William Custance, the house is in gault brick with a slate roof. Emma Darwin lived here between 1883 and 1896, after the death of her husband Charles. 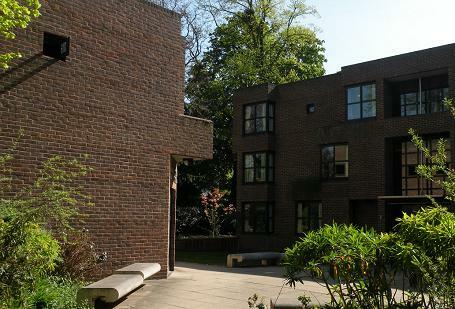 Denys Lasdun was Fitzwilliam’s original architect, and the College was his first university building. He later designed the University of East Anglia (including the ‘ziggurats’) and additions to Christ’s College, Cambridge (the ‘typewriter’). Lasdun was awarded the 1977 Royal Gold Medal. Designed by MacCormac Jamieson Prichard (now MJP Architects) New Court incorporated ideas contributed by junior and senior members of Fitzwilliam. The intersecting staircases create friendly, social spaces and in 1989 New Court won the first ever David Urwin Heritage Award for Best New Building. These awards honour the finest projects in Cambridge. MacCormac Jamieson Prichard designed the Chapel to suggest a floating ship, the hull of which is revealed in American white oak panelling through the fine white concrete. 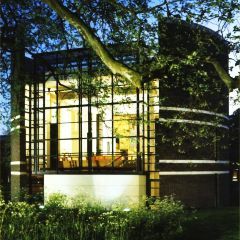 The Chapel won a 1992 Civic Trust Award, the 1993 Carpenters’ Award and the 1993 David Urwin Award for Best New Building. 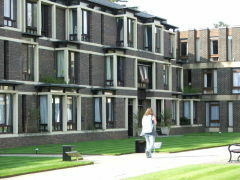 This intimate courtyard’s 48 student rooms, conference rooms and lecture theatre are all acoustically independent. Recessed and protruding windows create dynamic relief in the brick façades. 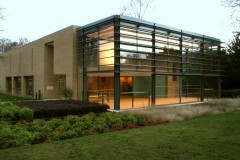 Designed by van Heyningen and Haward, it won a 1996 RIBA Award. 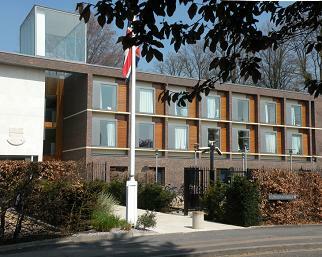 Gatehouse Court created a new entrance and frontage on Storey’s Way, reorienting the College to accord with Lasdun’s masterplan. 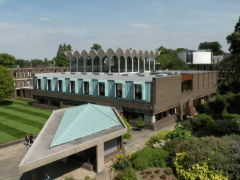 Designed by Allies and Morrison, it won a 2005 RIBA Award and, together with the Auditorium, won the 2005 Brick Development Association (BDA) Award for Building of the Year. The 250-seat Auditorium, by Allies and Morrison, is built from a brick similar to The Grove’s, and extends below ground, giving the seating galleries a ground-level relationship with the landscape. 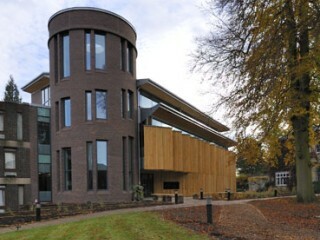 Praised for its acoustics, it won an RIBA Award, a Concrete Society Award and, together with Gatehouse Court, won the Brick Development Association Award for Building of the Year in 2005.